Since John bought me my check skirt and sweater combo at Christmas, I've been obsessed with pairing up skirts with jumpers. It's a really girly, cute and comfortable look that I don't go to often enough but have surprisingly been inspired the boyfriend to look into this. 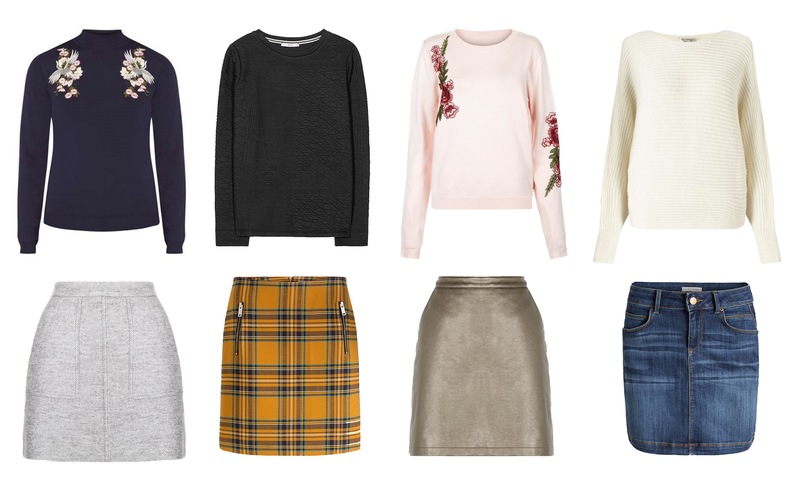 Recently whilst looking through the online sales I came upon some good skirts and jumpers that I think not only would look great with anything but together too. I thought I'd share my favourites. I have to say my absolute favourites has got to be the check business skirts from Esprit and this one in particular. It looks great with a black jumper of some sort to really make that yellow pop or maybe even a navy or a white? What do you think? And I'm in need of something embroidered at the moment since I still haven't dipped my foot in that trend... and if I can I'm going to try to get my hands on that gorgeous pink jumper from Cameo Rose at New Look. We shall see. These top-bottom combos work well for a lot of reasons too. It's the mix of textures that I love and think helps to make this work as well as the fact that it's an easy 'smasual' look suitable for both work and play. I love the idea of mixing a metallic skirt with a chunky jumper or swapping out jeans for a denim skirt instead too for the perfect ‘Saturday day out’ look. For now I've got some skirts like some of these at home, so I'm sure I'll be delving into the jumper-skirt combo a lot in the coming month. Wait up for the outfit posts on them! It’s got to be my new favourite top-bottom combo right now.